There are a variety of restorative options available when teeth go missing. Traditionally, dental bridges were used to restore a tooth to its original function, but thanks to modern technology, dental implants have taken the forefront. In his Albuquerque dental office, Drs. Lafferty & Bleak place and restore dental implants for patients who wish to regain a natural-looking and healthy smile. A dental implant consists of a titanium screw that is surgically placed into the jawbone. 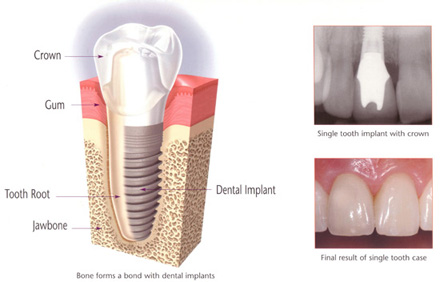 The implant fuses with the existing jawbone tissue and creates a fixed, durable new root for a tooth. The dental implant is then capped with an artificial crown that is created to match the size, shape, and color of existing the teeth. The result is a seamless smile that looks completely natural. Single tooth replacement uses a single implant to replace one missing tooth, which is then finished with an artificial customized crown. Multiple teeth replacement can either place multiple dental implants individually or use adjacent teeth as anchors for an artificial bridge. The implant creates a durable restoration that supports the dental bridge. Full arch replacement stabilizes a complete dental arch by placing four to six implants into the jawbone. 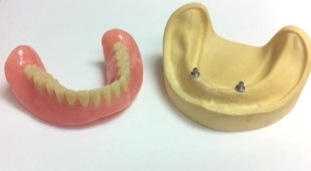 The dental arch attaches to the implants, creating a full denture that will not slip out of place. Dental implants have created a more efficient way to replace missing teeth. Whereas dental bridges involve the preparation and shaping of healthy adjacent teeth, dental implants allow dentists to only focus on the tooth at hand. Existing and healthy teeth are not affected by dental implants, and patients still receive polished results. Generally, patients in good health are qualified to receive dental implants. Those whose jawbone has a low density, however, may need pre-operative treatment. To find out whether you are a candidate for dental implants, Drs. Lafferty & Bleak will take x-rays and assess your medical history. Drs. Lafferty & Bleak use three-dimensional x-rays to virtually complete the dental implant procedure. With state-of-the-art equipment, Drs. Lafferty & Bleak are able to place your dental implants on a computer before the actual surgery takes place. This allows them to know exactly how to place your implants so that you can receive the best smile possible. To find out whether dental implants are right for you, give us a call in our Albuquerque dental office and schedule a consultation today!